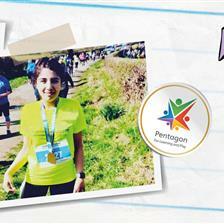 Over the past few years, schools across the country have been embracing both the Golden Mile and Daily Mile initiatives. 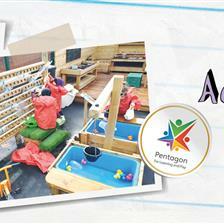 The aim being to improve the physical, emotional and wellbeing of children regardless of age or circumstances. Each programme encourages children to go outside and simply walk or run a mile (normally taking place for just over 15 minutes) during a school day. They’re fully inclusive; every child, whatever their circumstances, age or ability, can succeed and complete on average, one mile a day. Schools are beginning to see the benefit, not just physically but also in children’s concentration levels, mood, behaviour and general wellbeing. In 2015, Fit For Sport conducted a study of 10,000 primary school children across the UK and found that two thirds of them lacked basic fitness. With figures showing a decline in children’s general physical activity and obesity levels rising at record numbers, the Daily and Golden Mile initiatives have been warmly welcomed as a simple and effective way to develop fit, healthy and happy children. “I’m thrilled that my charity, the DKH Legacy Trust, has become the charity partner to the Golden Mile. 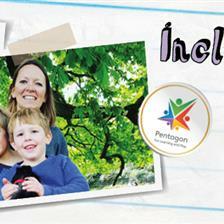 This is a fantastic initiative that will encourage so many to commit to an active and healthy lifestyle. Thanks to this partnership, we will be able to continue creating life chances for young people." With so many schools looking to implement these fantastic initiatives, some unfortunately suffer from bad groundwork, water logged fields and a dedicated space for children to complete their daily mile. Being a leading provider of school playground equipment, we are beginning to see a trend of schools looking to create their own daily mile track within their school grounds. 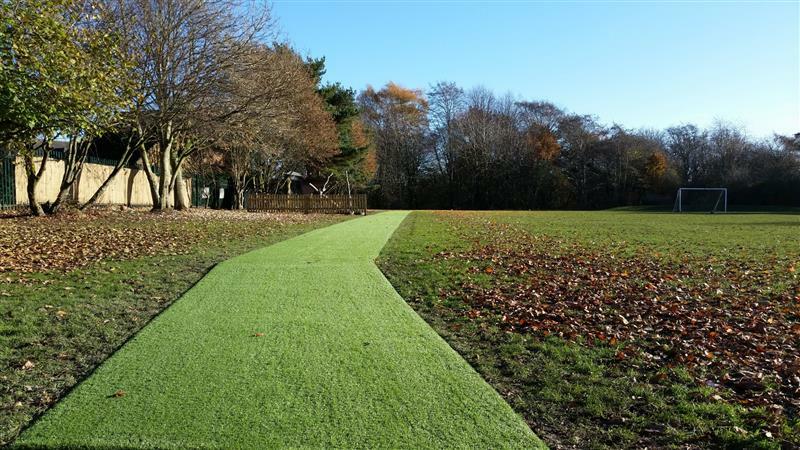 We’ve already worked with ten different schools to create different type of tracks for their daily mile which range from Artificial Grass, Thermoplastic Markings, Wetpour and Playbond. Artificial grass is an all-weather resource that solves any surfacing issue including mud and bad drainage. 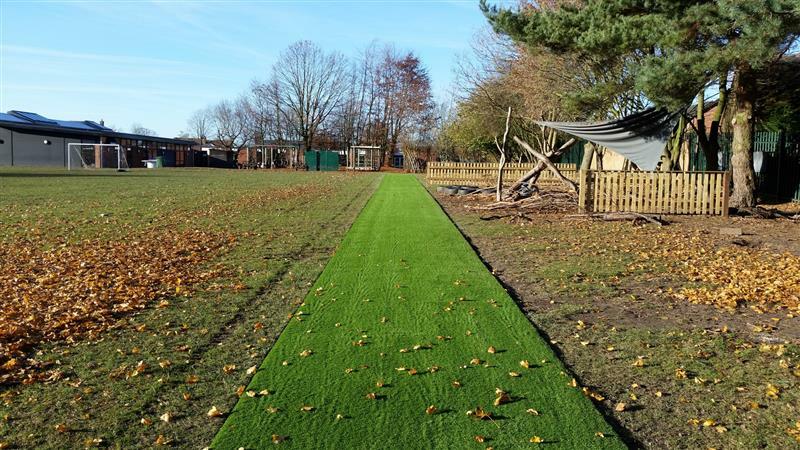 We can create a wonderful artificial grass track that wraps around your school field, eliminating any chance of it being inaccessible during bad weather conditions. A field has more genuine space to facilitate large numbers of children at any given time and helps give children a fresh sense of freedom. Using thermoplastic markings, we can create a clear daily mile track that flows through your school grounds on either concrete or tarmac. This is a great way for children to access their track straight form the classroom and make use of open spaces within the outdoor area. Learn more about our Thermoplastic Markings here. 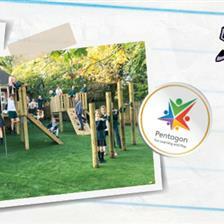 Wetpour and Playbond, are both excellent impact absorbing rubber safety surfacing options. They both have an excellent seamless finish and multiple colour options. 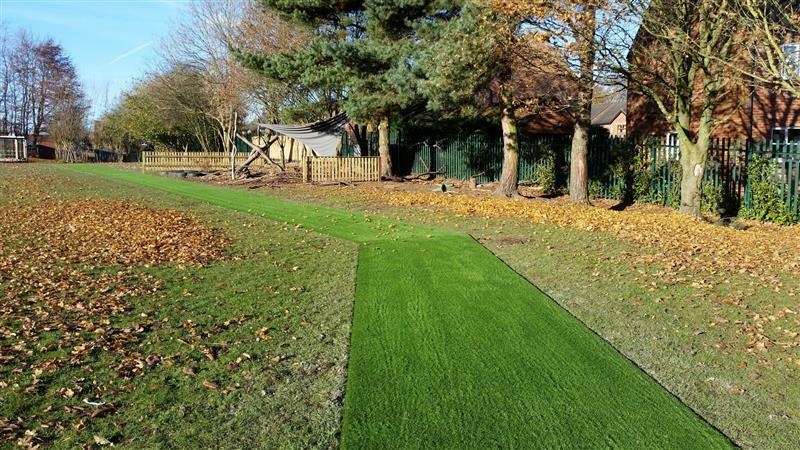 With a great choice of colour options to choose from, you could literally create a ‘Golden Mile’ track running through your entire school grounds. 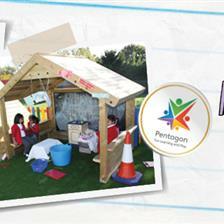 Learn more about our Wetpour and Playbond surfacing here. If you're looking to improve your outdoor provision to better facilitate your school's Golden and Daily Mile initiatives, simply fill out our Contact Form and we will be in touch to book a free consultation.